The much delayed LB elections' first phase has begun in Punjab and Sindh. Polling began at 7:30 am and is to continue till 5:30 pm. A total of 20 districts; 8 from Sindh and 12 from Punjab are included in these polls. 25 million citizens are going to cast their vote to elect representatives of the local government bodies. It has been clarified by the Election Commission that holding expired computerised national identity cards (CNICs) does not invalidate the voters from casting their votes. In Punjab, Lahore, Faisal­abad, Nankana Sahib, Gujrat, Bhakkar, Chakwal, Kasur, Pakpattan, Okara, Vehari, Lodhran and Bahawalnager have been included in the first phase of the elections whereas in Sindh, Larkana, Shikar­pur, Jacobabad, Kashmore, Kamber-Shahdadkot, Sukkur, Ghotki and Khairpur have been included in this phase. So far, in Punjab, the administration and police have been responsible for ensuring the smooth conduct of the polling and the ECP has stated that the army will only be called if the need arises. In Sindh, however, army has already been deployed at sensitive polling stations. An eighty-five-year-old devoted woman while exercising voting right has cast vote in Lahore’s UC 126 today. The enthusiastic citizen, Asghari Begum, reached polling station in UC 126 and cast her vote whereas locals of different ages also reached to booths to elect their favorite candidates. Polling began on time for Punjab Local Body (LB) elections in Lahore, Faisalabad, Gujrat, Chakwal, Bhakkar, Nankana Sahib, Kasur, Pakpattan, Okara, Lodhran, Vehari and Bahawalnagar districts.Rangers have been deployed at sensitive polling stations while army remains on standby. News of massive irregularities from all over the Punjab have been received, Waqt News reported. According to media reports a number of incidents of clashes between political groups have been reported. “In UC 1, Sangla Hill two individuals got injured. In Nankana, voting was suspended after a clash in polling station UC 12. At Cooper Road in Lahore a person tried to enter in a polling station with a weapon as police arrested him and in Bhakkar UC 36, the polling station has been established in a graveyard ,” media reported. “An ASI of police was making people vote for an independent candidate in Kasur UC 19," reports added. The first phase of local body elections is being held in 12 districts of Punjab and 8 Districts of Sindh. Pakistan Muslim League-Quaid (PML-Q) leader Chaudhry Shujaat Hussain has said that the Punjab chief minister was not in favor of devolution of power and successful candidates in local government polls will have to stage a sit-in to wrest power from those at the helm of the affairs. He said that the provincial government and the chief minister should immediately give powers and funds to the elected representatives to solve civic issues at the local level. Prime Minister Nawaz Sharif will cast his vote in UC 70 in Lahore, Waqt News reported. The constituency is known as his ‘home ground’. He won the MNA seat in the 2013 General Elections from the same constituency. A person got severely injured in Faisalabad at Dajkot during the voting process, Waqt News reported. “The injured has been transferred to Allied Hospital,” media reported. All hospitals in Faisalabad have been on high alert. Pakistan Tehreek-e-Insaf has established an election monitoring cell in Lahore, Waqt News reported. “The cell has been set at the office of PTI MNA Shafqat Mehmood,” the media reported. “We are monitoring the whole local body voting process in Lahore and keeping a record of the irregularities and rigging in the city,” a PTI member told the reporter of Waqt News. PPP members have lodged a protest under ex-MPA Sajida Meer according Waqt News reported. Protestors are demanding resumption of voting. The clash between Pakistan People’s Party (PPP) and Pakistan Muslim League-Functional (PML-F) members has left one person, Wajid Hussain, dead and 20 injured, Waqt News reported. According to reports firing broke out in the Thari Meerwa polling station in Kherpur, Sindh. The police have reached the site and are trying to control the situation. Five people were injured near Luqman Polling Station in KherpPur, Waqt News reported. There was a firing exchange between PPP and PML-F. Both parties are trying to force people to vote for their candidates, resulting in violating clashes. Polling at Sraye Sultan UC 70, Lahore polling station has been halted due to the security arrangements for Prime Minister Nawaz Sharif, Waqt News reported. The PM is going to cast his vote in this polling station. According to media sources voting has been discontinued for the past hour. “People will be given extra time for voting in the evening,” the ECP sources stated. Women have turned up in large numbers to cast their polls across Lahore. In some areas the number of women voters outnumbered the men. The areas of Canal View, Johar Town and Westwood are an example in this regard. It was thought that the divorce of Imran Khan and Reham would have an impact on PTI female vote. This seems not to have happened. Two groups of PML-N engaged in a firing clash in Nankan UC 1, Waqt News reported. Three persons, including vice chairman candidate Mian Faisal of Tariq Bajwa Group, have got injured according to media reports. Two persons of the other group led by Barjis Tahir also have got injured. 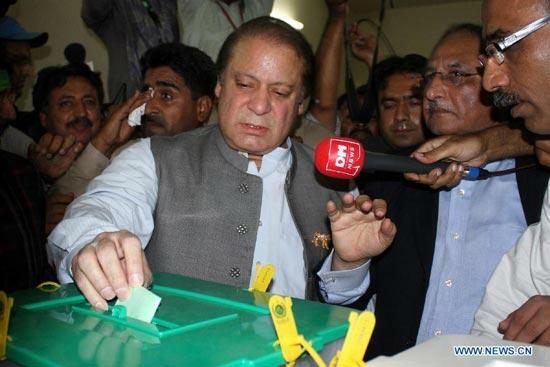 Prime Minister Nawaz Sharif cast his vote in UC 70, Lahore, Waqt News reported. There was high security arrangement around the area. Voting had been on hold for an hour and a half. The vote of General Counselor M. Hanif has disappeared, Waqt News reported. The incident happened in Haveli Lakha, Ward Number 15, according to media reports. Three persons have been arrested with weapons in Samnabad, Waqt News reported. The individuals were trying to enter in a polling station and disrupt the polling process, the media reported. The police have arrested them and transferred them to jail. PTI Punjab President Chaudary Sarwar has said that the party has received the news of rigging from many regions of Punjab, Waqt News reported. He was talking to media in Lahore. 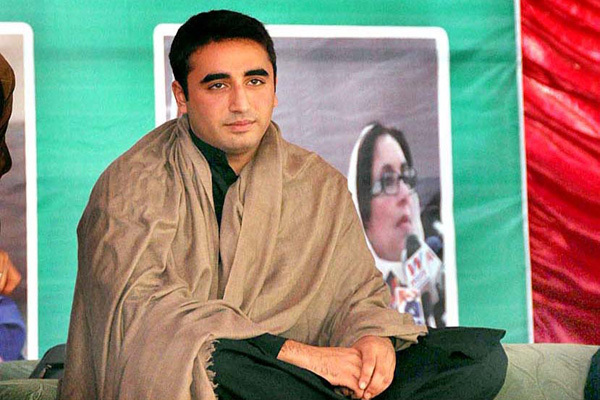 PPP Chairman Bilawal Bhutto Zardari cast the first vote of his life, during local government elections. The PPP leader cast his vote at a polling station in Ward 4 in Larkana. Smiling Bilawal also showed his ballot paper to the chanting party workers. Proper security arrangements were made for Bilawal. A large number of PPP workers were also present who raised slogans in favour of PPP and its founder Zulfiqar Ali Bhutto. Bilawal also met party workers at the polling station. Meanwhile, opposition leader Syed Khurshid Shah also cast vote in Sukkur. Ten people were killed in firing exchange in Thar Meerwa. Those who died were workers of PPP and PML-F. According to media reports the clash started in the morning at the start of polling process and 20 were injured in the firing. Two out of remaining 15 injured are critical. The media further reported that firing is still ongoing. The local authorities have extended the polling deadline from 5:00 pm to 10:30 pm. Seven people have died 15 got injured in fire exchange in UC of Daraza Sharif, Gambat Tehsil, District Khairpur, Waqt News reported. The gunfight occurred between the PPP and PML-F workers over voting dispute. The firing still continues and Rangers have been called in to control the situation. 20 people including a woman were injured in firing exchange in UC Seehar of Dokri Tehsil, Larkana, Waqt News reported. The injured have been transferred to local hospitals. Sindh Chief Minister (CM) Qaim Ali Shah’s close relative Irshad Jilani on Saturday was caught red handed trampling law. She attempted to cast votes of other women to ensure her nephew’s win in Sindh local bodies’ election. According to reports Jilani cast her vote at polling station number 8 in Kherpur where she was also seen forcing other women to vote her nephew who is contesting the elections for counselor’s seat on PPP ticket. Meanwhile, the performance of electoral employees in Sukkur was seen inefficient as the residents broke the locks of male polling station with bricks. The polling had started after 20-minute delay. In Lodhran, supporters staged protest outside polling station number 49 against the misprinting of papers whereas UC 231, UC-84 and UC-86 of Lahore also witnessed demonstrations over the same cause. The deadline for polling has ended in the phase one of the local body elections in Punjab and Sindh which were contested after a decade, Waqt News reported. People still inside polling stations would be allowed to cast their vote. The ballet boxes will be taken to one place and counting will start as soon as the final vote is cast. Voting would continue in those polling stations where voting had been postponed owing to security concerns or violent clashes. The vote counting has begun.